Hailing from Finland and just four years old, Altar of Betelgeuze are a wonderful find. Something like a cross between Candlemass, Kyuss, and Hooded Menace, the band combine blissed-out stoner grooves with vicious death-doom crunch amongst other influences, forming a doomy whole that's very enticing indeed. There's clearly still much to get right in the formula – the two halves of the band's sound don't always gel as best as they could and some of the clean vocals aren't very good. 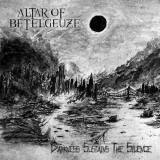 But that Altar of Betelgeuze are this good already is very promising. They have the doom sound down perfectly, for one, with a rich, deep guitar tone that simply breathes dolefulness. And their songwriting is very good, keeping your ear finely attuned with a great selection of riffs; several members are also in death metallers Decaying, and the crossover influence is considerably. Fear not though, gloommongers, this is far more doom than death, although it teases the listener on the journey there. After brief intro Epitaph (bonus points for it being a mini-doom piece rather than anything keyboard-y!) first track proper A World Without End rolls in with barely restrained grandiosity, classic doom riffs holding you entranced before death metal growls are added to the mix, giving it a strange Asphyx vibe. Kicking up into a stoner jaunt towards the end, the track speeds up without breaking the spell and adds epic spoken vocals and monkish chanting at the end, adding a touch of Cathedral-lic Hammer Horror gloom to proceedings. Spiral of Decay begins in outright old-school death metal mode, but adds some initially poor, almost grunge-sounding clean vocals that spoil the effect, although the band recover soon after with some great riffs and drumming. Steamroller lives up to its name, with a chugging doom churn and a far better use of those grunge-tinged clean vocals making it sound like Alice in Chains jamming with Electric Wizard. It's the ten-minute Smouldering Clouds Above Orion that lets you know the band are truly serious about doom, though. Building up deliciously slowly with a My Dying Bride vibe, Altar of Betelgeuze produce a very dark track that's funeral doom done perfectly, full of atmosphere and even fitting in well with the rest of the tracklisting. The following The Approaching Storm begins slowly, churning away miserably before reintroducing the clean vocals and moving back towards stonerville. And by the time everything is brought together on the closing seventeen-minute title track, which ties loose genre threads together and feels far shorter than its length, you'll be fully on board with Altar of Betelgeuze's shtick. Yeah, it could use a little polishing and feels like the band are still finding their sound, but it's a good doom album that isn't afraid to do the unexpected and do it well. A name to watch.